For many years I cooked every weekend on a charcoal kettle. The charcoal kettle design has been around for decades and has been copied by every barbeque grill manufacturer. The kettle has been a useful barbeque design because of its ability to control temperatures with vents placed above and below the cooking surface, which also places the vents above and below the burning charcoal. The placement of the vents and the embers made the kettle capable of very low temperatures, very high temperatures and everything in between. For a while the charcoal kettle seemed ubiquitous, indicative of suburban family life and I enjoyed starting the process of barbecuing dinner by starting the fire while lunch was digesting. I loved my charcoal grill and still remember it happily but I found a better way. Typically a charcoal barbeque kettle has a rounded bottom and two grates inside. The bottom grid is for the charcoal to sit above the floor allowing air flow under the burning charcoal. The top grid is the cooking grates for food placement above the burning charcoal. Vents are closed and opened to varying degrees under the charcoal where the airflow is built into the bottom of the firebox. The top vents are built into the barbecue hood. Wide-open vents allow full airflow and greater temperatures and as the vents are closed the temperatures drop and eventually go out when vents allow no airflow. What I loved about my charcoal BBQ was this control over the heat. Traditionally to use the charcoal BBQ the charcoal is left to burn until it burns down to embers with a light coat of gray ash. Once the charcoal has burned to a glowing red lightly covered with ash the heat radiates strongly off the coals and the amount of heat is controlled with the vents. What most people love about charcoal is the flavor. 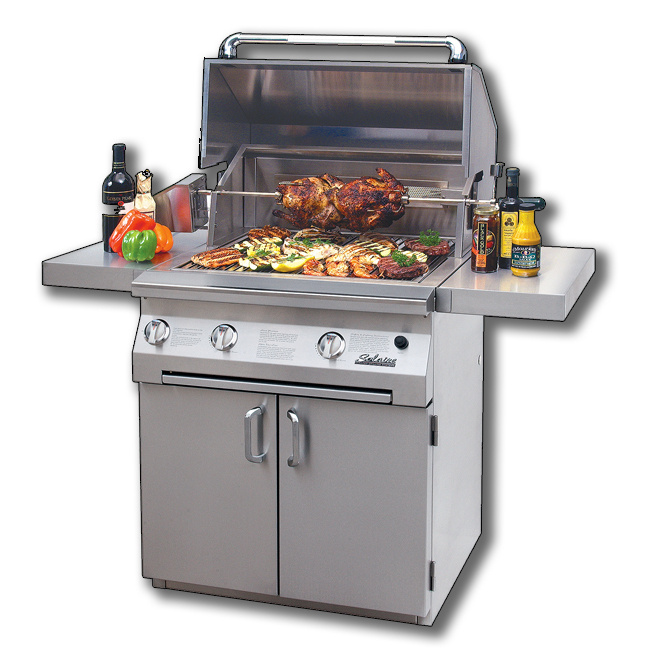 Gas barbecues slowly heat the air trapped inside the BBQ hood and the hot air surrounds the food. This convection causes the food to cook but it also heats only to about four hundred degrees because of the ability of air to transfer heat. The materials inside the gas barbeque are not usually enough to radiate an additional heat unless briquettes or lava rocks are used. When hot air surrounds food inside a gas barbeque at a maximum of four hundred to four hundred fifty degrees the food cooks slow and drips moisture, losing flavor. In contrast, charcoal is burning wood and the smoky wood flavor is what most people love about charcoal barbecuing. The charcoal barbeque is not using air to conduct heat although the oxygen is necessary for the flames to continue smoldering. By the time the charcoal briquettes are smoldering and lightly coated with ash the heat is radiating off the briquettes directly heating the food above it. This is important because charcoal barbecues can radiate a lot more heat than a typical gas barbeque. Restaurant quality searing is considered over eight hundred degrees because at temperatures over eight hundred degrees the outside layer of food is seared. Searing the food on a grill means the food seals so no more flavor is able to escape as dripping. The natural moisture in the food stays where it belongs as flavor. A charcoal barbeque grill is capable of barbecuing at very low temperatures for longer times and it is capable of searing steaks fast and hot and there is only one gas grill in existence that can duplicate this versatility. Thirty years ago a company called Thermal Engineering Corporation (TEC) invented the infrared burner. The name “infrared” refers to the invisible light of the light spectrum where these heat waves are found. The important thing is that an infrared gas grill can duplicate the effect of radiant heat ranging from three hundred degrees to over thirteen hundred degrees just below the grilling surface. The radiant heat is direct providing a seared surface on food is seconds rather than the convectional heat transferred in air. 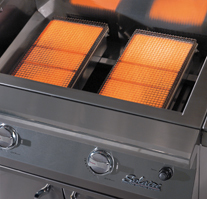 Infrared gas grills have all the features that cause us to sacrifice flavor for convenience when we buy a gas barbeque but the infrared burner is over one thousand degrees within a minute of pushing the grills’ ignition. Grilling with an infrared gas grill requires no recipe; no combination of sauces, rubs, spices or marinades is necessary. An infrared grill produces the effect of a charcoal grill an hour after the coals are initially lit. Within seconds the pressurized burners are radiating over one thousand degrees searing steaks from the outside and locking in natural moisture and flavor without the ability to cause absorption of carcinogens or carbons that are possible with some brands of charcoal. An infrared gas grill is all that is good about charcoal and all that is convenient abut a gas barbeque. Obviously the infrared gas grill is useful when grilling steaks and other red meats because of the high temperature and fast grilling times. Infrared burners are amazing for grilling fish also. Wild swordfish steak with a light blackened seasoning rub and lemon juice on an infrared grill is ready to eat in about five minutes. On a traditional barbeque this would take more than thirty minutes and would produce a much drier dish. My family and I find the infrared grill indispensable at home for two reasons. First, the incredible heat allows cooking times to diminish. We grill skewers of chicken, frits and vegetables in minutes. Steaks, hamburgers and fish grill quickly at the cooking surface and hot dogs for the kids can grill from the warming rack about eight inches above the grilling surface. In addition to speed and flavor the size is convenient. For two years we used a small portable version of the infrared gas grill manufactured for tailgating and camping. This small grill was more than enough for a family of four. Now that we have a twenty-seven inch infrared grill built into an outdoor kitchen we use only half the grilling area except when we have birthday parties and company. Infrared grilling has simplified home life. Cooking time is less and sitting with my family eating has grown. With a maximum temperature of fourteen hundred degrees there is no need to schedule time to clean the grill; it is like a self-cleaning oven. Recipes have become simpler and flavor has grown although ingredients have diminished. The infrared gas grill burner is the most technologically advanced form of cooking on the planet and we had to save money for awhile to place one in our home but it has improved our life and our time together which is what we expect from technology anyway. The fact that we cook together outdoor more often than indoors is an added benefit. Thank you for the insight into infrared. We're more traditional charcoal and gas not yet tried infrared grilling. After reading your article infrared grilling looks quite interesting. We have a resourse here on gas grilling turkey, would you think there is a huge difference in the cooking technique from gas to infrared, I would imagine it's to with regulating the temperature of infrared that we would need to become familiar with.